What is worse, I wonder? Having good intentions and leaving them unfulfilled? Or never having the good intention in the first place? I like to think it is the former. Having good intentions, even unmet, means that there is hope and potential. Thus I opt for the good intentions and at times, I surprise myself and follow through. There are two good intentions I had in December. One was to do a shout-out for New Hampshire authors that follow me on Twitter. I was to do this early in the month in honor of NH Writers’ Week, but to use a different cliché , better late than never. Please visit my Twitter Authors page to see who’s who in NH Writing. If you are an author and you don’t see your name on my list, follow me on Twitter and let me know you write for NH. My other good intention was to finish my first draft of my first-ever novel by December 15th. For writers, this is a hurdle that must be accomplished to move forward. While I missed the deadline, I did finish on December 20th at 9:10 AM. Just in time to open my eyes and realize Christmas was only five days away. I blinked several times, figuratively set my pen down, and dove head first into the holiday season. Seven days later, the hard work of revision begins. Read my story as a reader. Does it make sense? Is it interesting? Would I want to read it? What longing does it fulfill in the reader? Why does this story exist? Writing is a craft. It’s time to sharpen the tools that I need for the craft. To do that I need to reread books about writing. I have a stack, but having never read Stephen King’s On Writing: A Memoir of the Craft, I have chosen to start there. Don’t hint at where you won’t go. For example, I have a bridge slashing shadows across a face. Do I really want to go there? If not, remove the imagery. If so, get brave and write the scene. Are my characters being too safe? Even though I have grown to love these characters, they need to make poor choices. Know my characters. What makes them act the way the do? Write character sketches for the main characters. For all others, at a bare minimum, know what does he/she wants. Every character needs to want something. Reread my novel as a writer. Keep a list of where it falls short and where it sings. Within weeks I will begin my revisions. I am overwhelmed and excited. My goal: to keep this novel in the category of fulfilled good intentions and to avoid the plague of unfulfilled promise. I’ll keep you posted. If you are a writer and have any advise on how to revise a novel, I’d love to hear from you in the comments below. This entry was posted in Fiction, Reading and Writing and tagged fiction, good intentions, Stephen King, Twitter Authors, writing. Bookmark the permalink. Congratulations on finishing your first draft! It sounds like you have a good (aka reasonable) plan to keep moving forward. King’s memoir is on my reading list for the coming year as well. Thank you for visiting. I’m enjoying King’s insight. Plus the break from my obsession over hitting my deadline has been refreshing. Congratulations on completing your first draft of your first novel! What an accomplishment! One thing I find helpful is to let my first draft breathe for a week or two, before touching it. Time and distance is a writer’s best friend. Also it does help to share a few chapters with readers you trust to get some initial feedback and guidance for revisions. When you get feedback, good or not so good, it will provide the necessary fuel for revisions. Can’t wait to hear more about your journey! Also thank you for the mention on Twitter Authors page! It’s greatly appreciated. I look forward to returning the favor. Thank you for your comment! I am fortunate to be part of a writing critique group. They’ve reviewed the first two chapters and have asked for the third. I think giving the time and space is a great idea. Thoughts can peculate a bit that way! Hi Barbara, It’s Masheri. I didn’t mean to be anonymous, I just forgot to include my name. Time is really important-time to leave it alone for a while and then the time to make revisions without interruption from our daily life-LOL. Proud of you! Again, hearty congratulations! Thanks again! It’s so nice to have your support. Congratulations on finishing your draft! 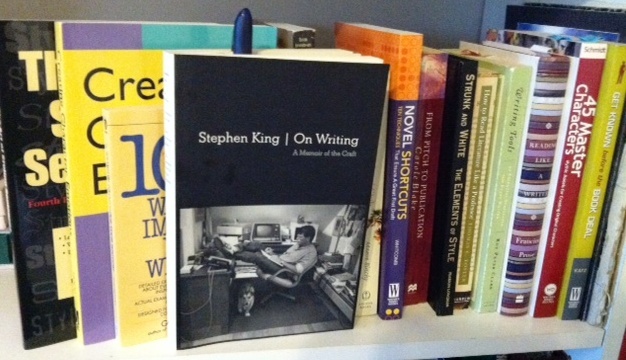 I haven’t read Stephen King’s On Writing: A Memoir of the Craft, but it’s on my list. I’m looking forward to your updates. Very best wishes! Thank you for your comment. King’s book starts as a memoir of writing and now I believe it is shifting into information about the craft. It’s been a fascinating ride so far.